Layer 1 - I started the first layer using a Tim Holtz mask (just a couple bucks at Michaels). The mask is just a bit tacky on the back so it will stay in place while inking. 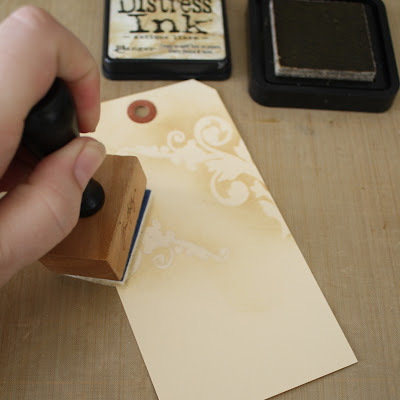 Use Antique Linen Distress ink and a blending tool to apply the ink. I find that it is best to use a "pouncing" motion...in other words, moving your hand up and down instead of side to side when applying the ink over the mask area. There is only one flourish in this mask set so you must work one at a time down the tag. Since we want the flourish to remain the tag color (or the lightest shade), only pounce the blending tool in the small area around the mask. Layer 2 - Use a script stamp (I used the same script stamp throughout the entire calendar) and Antique Linen distress ink to stamp over the entire surface. Layer 3 - Now change inks to the darker Vintage Photo Distress ink. 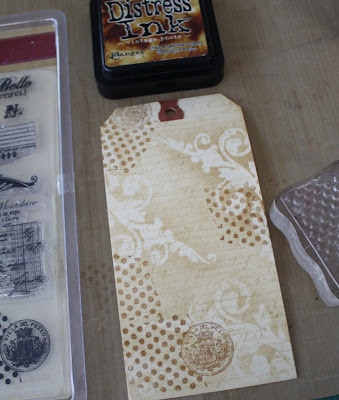 Use the 7gypsies Venice clear stamp to stamp the polka dot/seal randomly on the tag. Layer 4 - Use a blending tool to ink the edges of the tag with Vintage Photo. Set tag aside and lets work on the chipboard pieces. 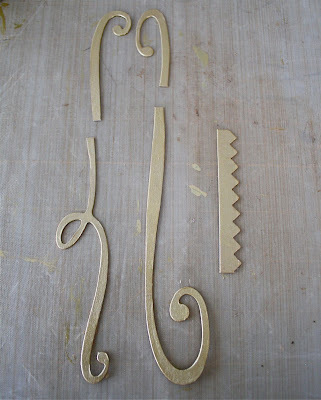 Punch out three chipboard pieces: 2 swirls and 1 sawtooth border. Cut the border piece the width of the tag. 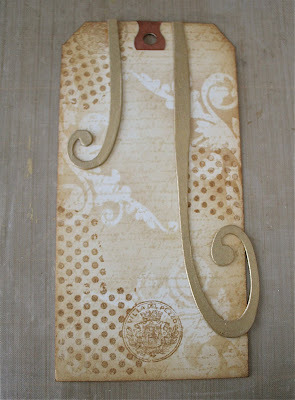 Paint chipboard piece with Adirondack Metallics- gold. Let dry. The chipboard pieces in the package were too long for the tags so I thought I would cut them to fit and maybe layer them to look like hanging ribbon. So I laid them on the tag, found the design I liked and then just clipped them off. I sometimes think we only see what the manufacturer wants us to but there are really so many more choices. 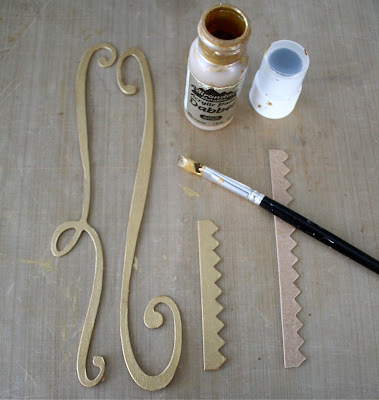 Don't be afraid to make something your own by altering it's color, shape or intended use. I used 3 pieces of the swirl that I painted on tag 23. 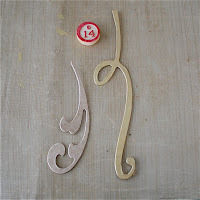 There was 1 piece left over...you can see here that it finds it's way onto tag 14 with another flourish from the same set. 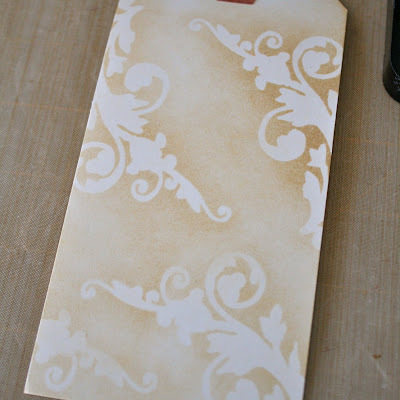 Adhere two of the gold swirls to the tag with glossy accents. 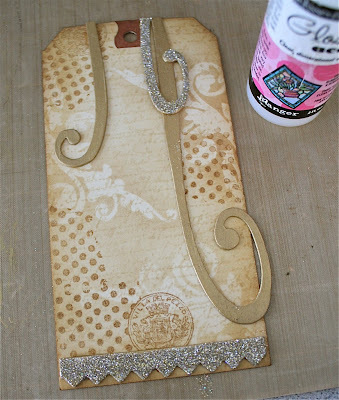 Add glitter to the last two swirls and adhere to tag. You might be saying, "why did she paint the pieces only to add glue and glitter over the paint?" Well, glitter can be fickle. The more you handle the piece, the more glitter comes off on your hands. I knew I was making this calendar for the "long haul"...in other words, I am going to keep this for a long time and I want it to last. The paint reassures me that even when the glitter is wearing off from handling, the paint will stay and mimic the color of the glitter. 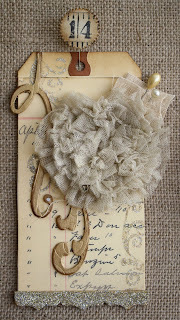 Just as in the last tag, I used a vintage 7gypsies rubbing to add some words to the tag. Here is an alternative for the rubbing, it's another stamp from the Venice clear stamp set (this stamp hasn't let me down yet!) 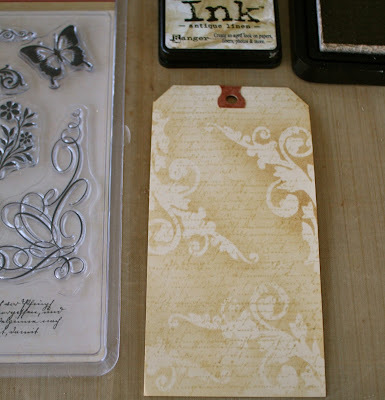 The original is on the left and the stamp is on the right (it says, Very Beautiful). Oh, and if you look really close I used a Tiny Attacher (aka Tim Holtz stapler) to staple the ends of the sawtooth border. Yet another tool I cannot live without. And the very last thing is to change up a large hanging crystal from the Princesca kit. These are very popular around the gypsy camp this season! All I did was take a big bead from a broken necklace I found at a thrift store...it was one of those pay $5 for a bottle of junk jewelry things...probably the best $5 I have ever spent. It's a year later and I am still digging stuff out of there...would you believe the bell on number 25, the little buckle on number 22, the beads on number 1, the big shoe clip on number 16, the scarf holder on number 19...they all came out of one jar found in a junk store. I think I should have bought more than one jar...now that's ONE LUCKY DAY! But I digress...back to the crystal - add the bead and another crystal from the kit for hanging. Add a monogram rubbing and you are done. The word "Christmas" and my last name start with C so I thought that was a good choice for me. Gather your tag and the crystal and pin to the board. Remember, If you don't have a Tiny Attacher in your tool kit, you need to ask for one for Christmas. You won't be sorry. I am absolutely loving the advent calendar. You are giving me some great ideas!! Love this tutorial! These tags are just stunning! Amazing tag and fantastic tutorial! Thanks for sharing! Thanks for sharing another tag! I'm truly enjoying these tutorials. oh paula, be still my heart. if i had an OUNCE of your talent i would be complete. i need to schedule a week with you and deb, maybe some of your genius will rub off on me too. loves! Just stumbled upon your lovely tags! Such great ideas! Awesome project! absolutely LOVE the old lace from the attic color scheme. gorgeous. I love that lace too! It was totally ONE LUCKY DAY when I found them. I was in a great little store in Carpinteria, Ca called Whimsy Antiques www.whimsyantiques.com/ and I spotted a large cello bag of all kinds of vintage millinery pieces. There were two of the old lace pieces in the bag. That was almost 1 year ago and this is the first time I am using them. It's that hording thing again!